At least 5 people have been injured by a bomb blast close to a bus in Cairo, Egypt’s health ministry has said. Earlier reports of a death have been discounted. 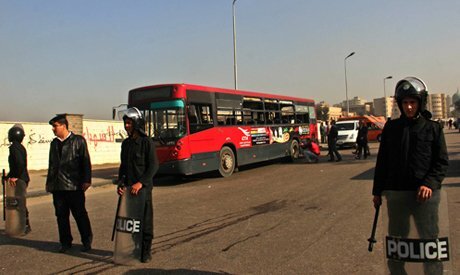 The bomb was planted on a pedestrian island and exploded as the public bus passed by in the northern district of Nasr City, a security source said. It comes a day after the government declared the Muslim Brotherhood a terrorist organization. Explosive experts detonated a second bomb that was planted in an advertising board close to where the first explosion went off in Nasr City. The Muslim Brotherhood, whose candidate Mohamed Morsi won the presidential election in 2012 before being deposed by the military earlier this year, had already been outlawed. A Muslim Brotherhood leader in exile vowed that protests would continue. In recent months, Egypt has seen a wave of attacks which the authorities have blamed on Islamist militants.